In the days of old the alchemists extracted and refined the essences of herbs, minerals, and metals and then carefully mixing them together again to create “stones”. 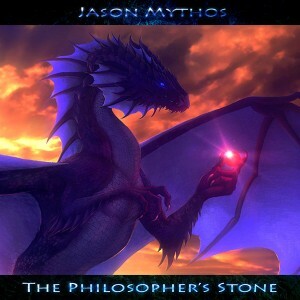 Today, Jason Mythos, an alchemist of a different type creates a “stone” by extracting and refining the audio essences of guitar, amp-distortion, synths, and a dash of bit-crushing, mixing it all up into this progressive trance elixir, The Philosopher’s Stone. Featured here is over 80 minutes of music produced with passion and mastered with emotion by Jason Mythos with artwork by xXKiragaXx. As a bonus, this album also features production notes with screen shots and a link to over a gigabyte of audio samples that Jason has released into the Creative Commons. MP3 Download | FLAC Download | WAV Download · Download count: 4,530. This is not the level that is expected from Ektoplazm. Loved this one :) Listened to it all the way through. “Red Stone”, “Die Hard” are my fav! “This is not the level that is expected from Ektoplazm.” HAHAHAhaaaaaaaaaaa…. Thank you for contributing to the complexities of sound which we all question…. Such a low rating is just not fair to this release. I think it turned out good; some tracks are not to my taste and others are really good – really the story of most albums. I think the problem people had with the album was they were expecting the typical baselines of progressive, which in this album are much less noticeable or non-existent. Personally, I find it refreshing, takes me back to the days I jammed to the old school stuff. Interesting… I feel that this music is very well-produced, in the meaning that it is done by a music lover. That’s why some find these tracks “not too complex.” Not that they are simple, either. They are just not over-complicated. Every bit of the music makes sense. Not that I am not enjoying all the rest of the music on Ektoplazm, but this one is particularly easy to enjoy, because it’s made more with the heart than with the head. Being my last Creative Commons Album I chose productions based on past musical influences and sounds I hold close to my heart. I thank ALL of you for your time, consideration and valuable comments on the album. I thank Ektoplazm for providing an incredible portal full of trance in all of it’s diversity with talented and amazing artists from all over the world. I liked this one very much. The low rating seems not right at all…. listening more of your music right now and i need to say, that are many epic tracks here, and some masterpieces too, every 30 second in a track and the melody changing, i will keep your music with me for my entire life! IS TOP OF THE TOP AND PROBABLY RESONATE FOR ALL THE TIME IN THE UNIVERSE:IT HAVE NO WORDS TO DESCRIBLE AT WHICH POINT IT HAS TOUCH THE PERFECTION . This is great. I’ve been looking for a really soul-felt psytrance album and this fits the bill. Fabulous- definitely ranks in my top 20 psytrance albums ever. Terrible mixing and mastering. Sounds like there’s mud all over my speakers.